Our first summer of drought we had issues trying to get enough water to the vegetable plots. 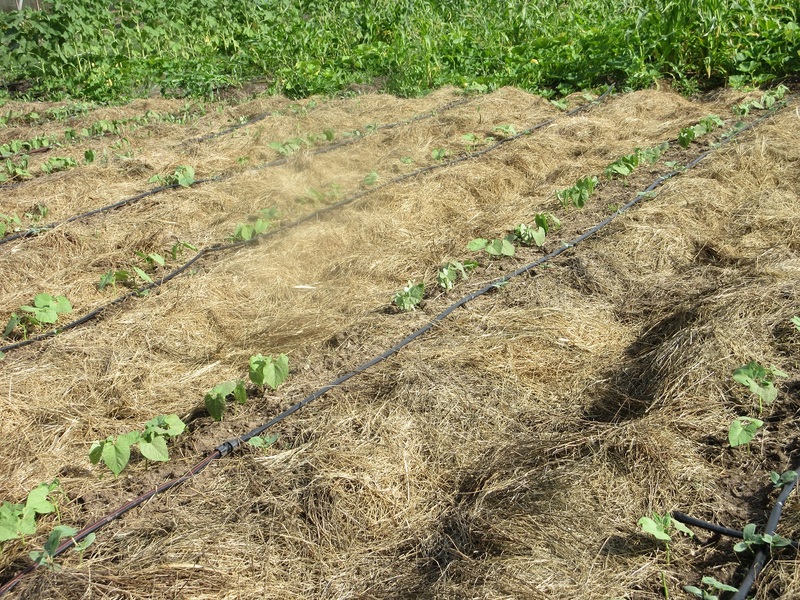 Our second summer of drought, we installed drip lines to water the rows. And then couldn’t keep the soil moist enough under the burning sun. 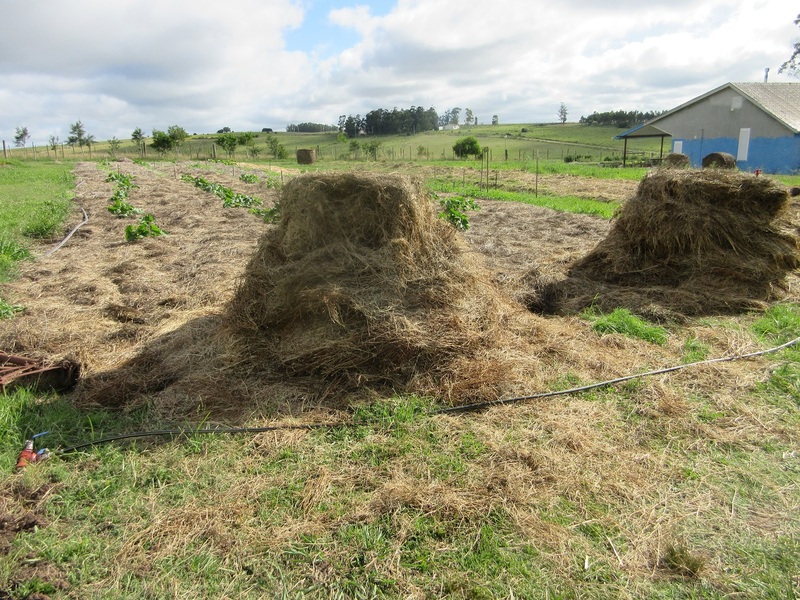 This year, while there has been no drought, we have learned how to keep our soil moist. Mulch. Lots and lots of Mulch. The hot dry wind that arrives every evening dries out the top inch of soil building a hard crust, while a few inches down, the soil is moist. So, MULCH is our friend! We have placed it in all the plots and around the base of all our trees. It is working very nicely. The walkways squish as you walk between the rows harvesting. The ground is moist – success! 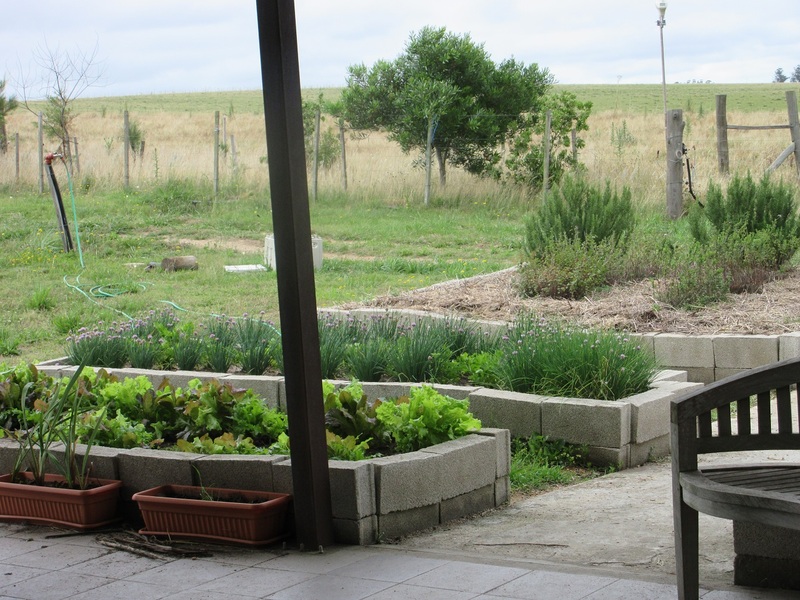 Growing our own produce is a nice luxury, even if it is time expensive. 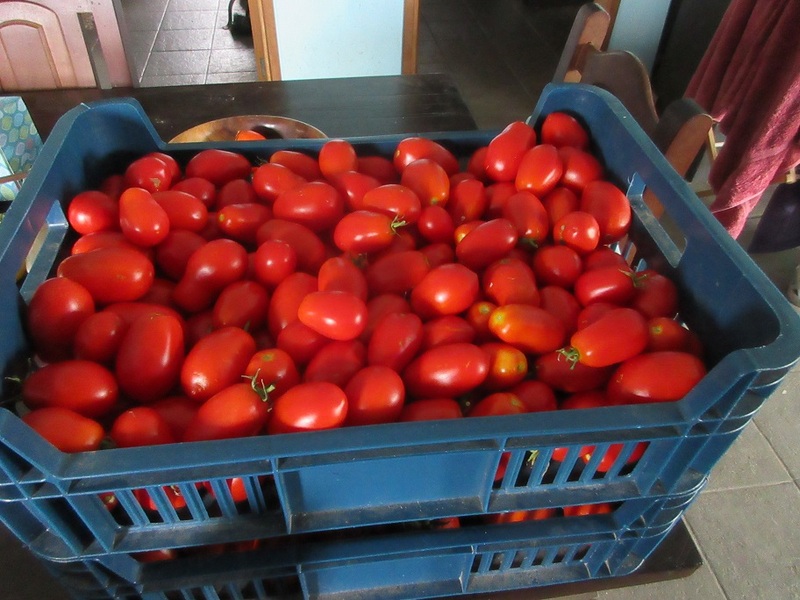 We enjoy being able to grow and eat various fruit and vegetables that we cannot find in the markets. We also enjoy being able to extend the availability of some vegetables. If it is not “in season” it is not available to purchase. Also, produce trucks are not refrigerated nor are the vegetable bins in the market, so shelf life once we bring it home is short. Eat it soon or it becomes chicken food. So, now you can understand our delight in having fresh strawberries! 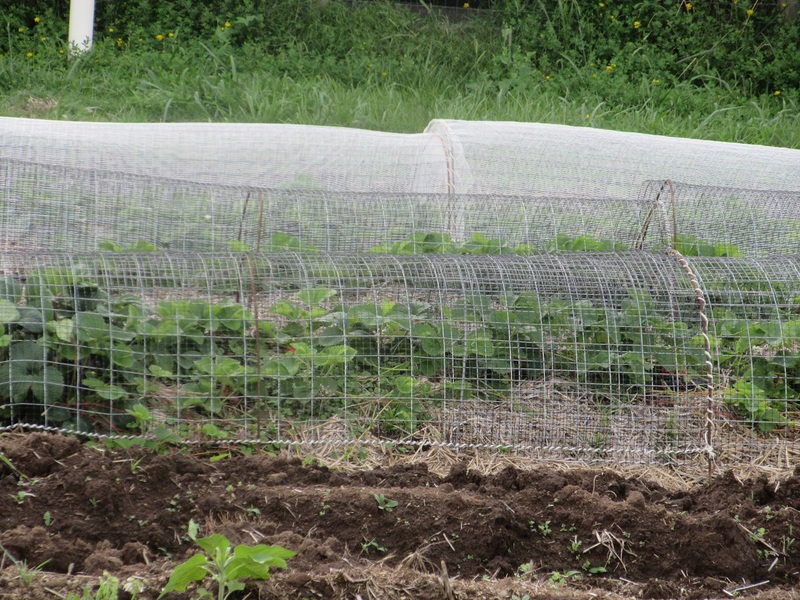 We have managed to put netting over the plants so that we do not share too many of our delicious strawberries with the birds. 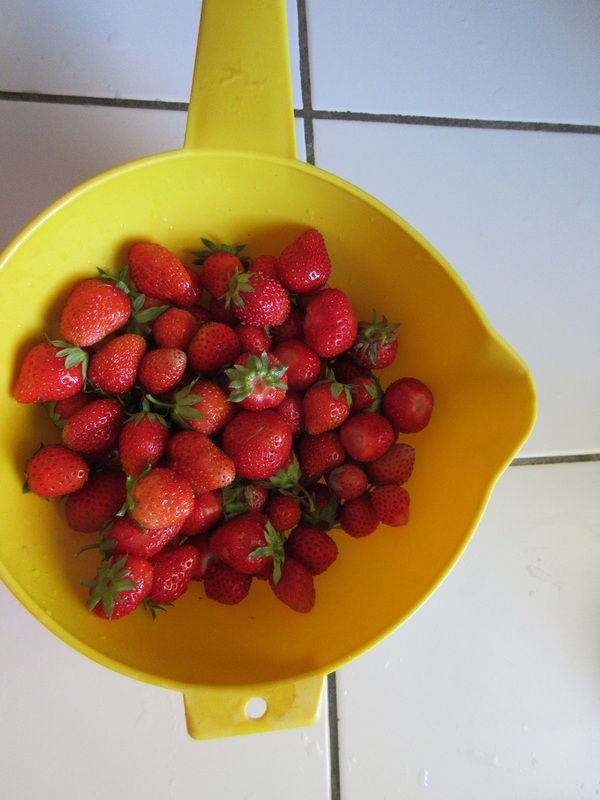 We have now enjoyed several bowls of strawberries. As this season winds down, we will need to separate the strawberry plants and we will get even more fruit next year. YUM! The green houses are HOT! 40 degrees + Celsius when nearing mid-day. And, Yes, Uncle Mark, we added shade cloth and have planted several passion fruit vines (Brazil natives which really do love all that heat and humidity) to grow up and expand across the ceiling to act as living shade. It is easier to work in the green house in the winter when it is cooler than sweat the day away in the summer. We have one working greenhouse where the seeds are planted and set on shelves and watered diligently. Then the sprouted plants in boxes are moved outside to harden off and then the plants go into the garden bed. 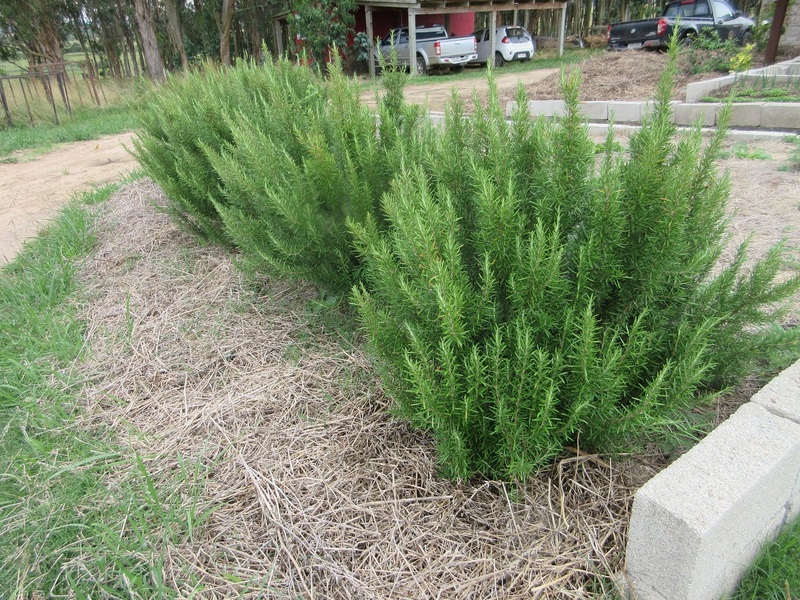 Some plants are outside in a garden plot in a few weeks, others take several months. The next two green houses have plants in the ground. We have a drip line watering system and the rows are covered with mulch. 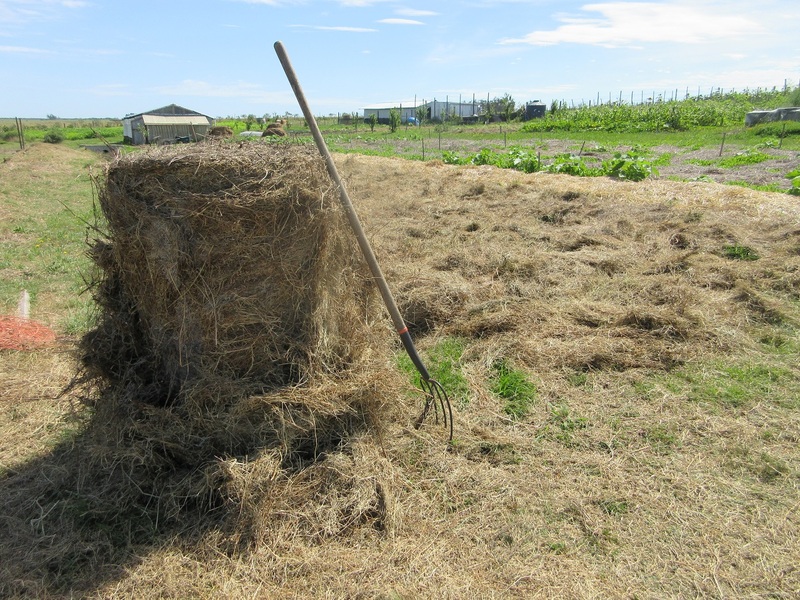 The mulch keeps the weeds down and keeps the soil from drying out quickly. This past winter was a bit of a disaster garden which so we pretty much ignored the green houses all winter and had to prep the soil after pulling weeds this spring. To our surprise we found a few plants that thrived on the neglect. Bell peppers all year round. 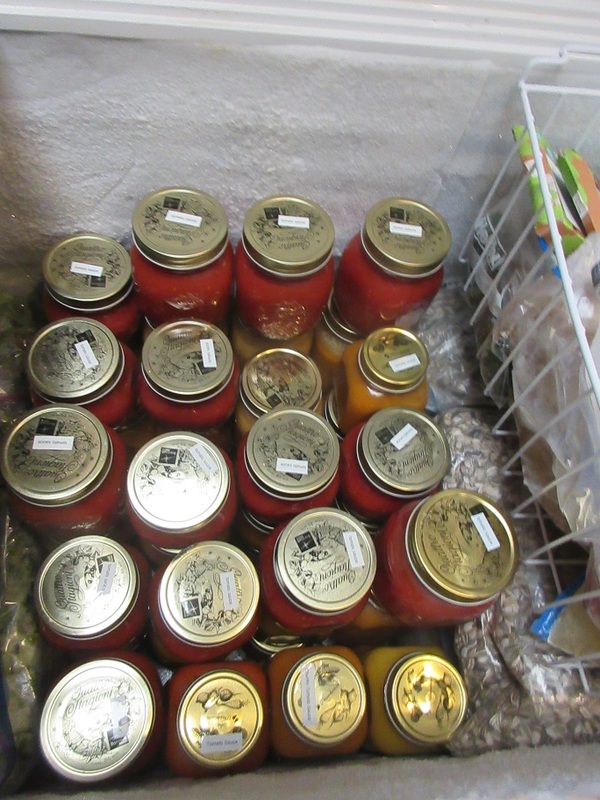 After summer in the markets, pickled peppers are the only kind one can purchase. They show up cold on pizza too! Megan left a volunteer tomato plant to grow in the green house and we had cherry tomatoes before any fresh tomatoes were in the market and and long before any of our plants outside even had fruit. A little thing but it really lengthened the tomato season for us. 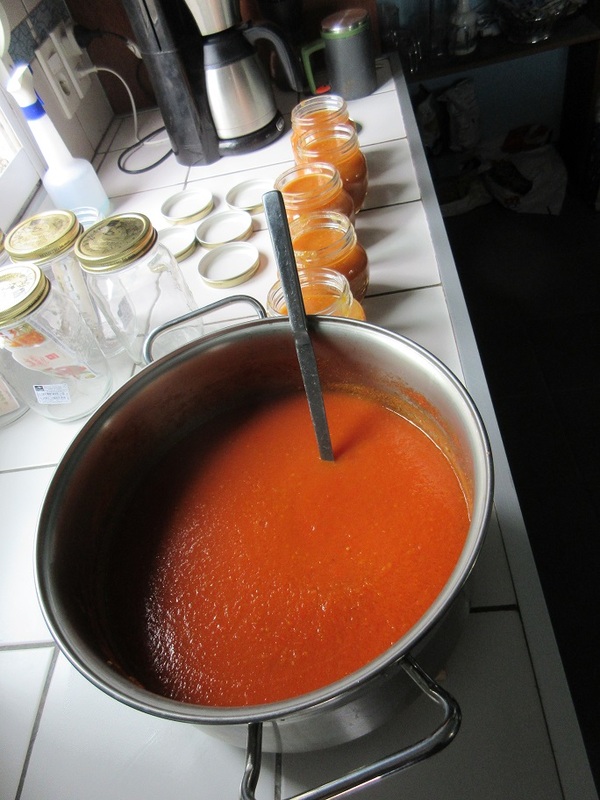 The last survivor of neglect was the Bulgarian Carrot Peppers – which are hot peppers. Excellent for hot salsa; way too spicy for me, but Jon loves it. A few years ago (three , I think- it might feel like we’ve been here forever, but really, it ‘s hasn’t been that long) we planted a couple of rows of sunflowers in the garden. We fed all of the plants & seeds to the animals and Megan saved seed for future plantings. This year, Megan again planted sunflowers, and while we will again feed the seeds and stalks to our animals, we also used the plant to act as shade and trellis. Or at least that was the intention. Bed # 3 – the garden bed farthest up the hill from the house, but next to the green houses still (one day I’ll post a map and you can all picture the garden layout. Until then, just pretend.) Megan planted every other row in sunflowers using the seed she saved from those first flowers. In between the rows of sunflowers we planted broccoli, cauliflower, celery, and carrots so they would have shade and not be exposed to the harsh sun. 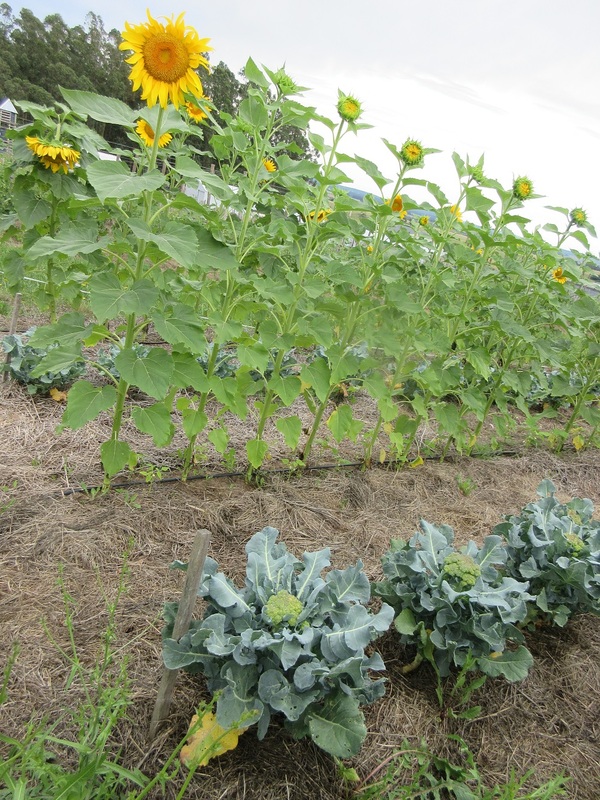 The sunflowers grew so fast they provided fabulous shade for the brassicas & the carrots – we just finished harvesting the last of the broccoli now in January. With the shade of the sunflowers the broccoli held in the garden nearly a month longer than last year without bolting. Success!! As trellis, however, the sunflowers have been, as Megan puts it, a total failure. 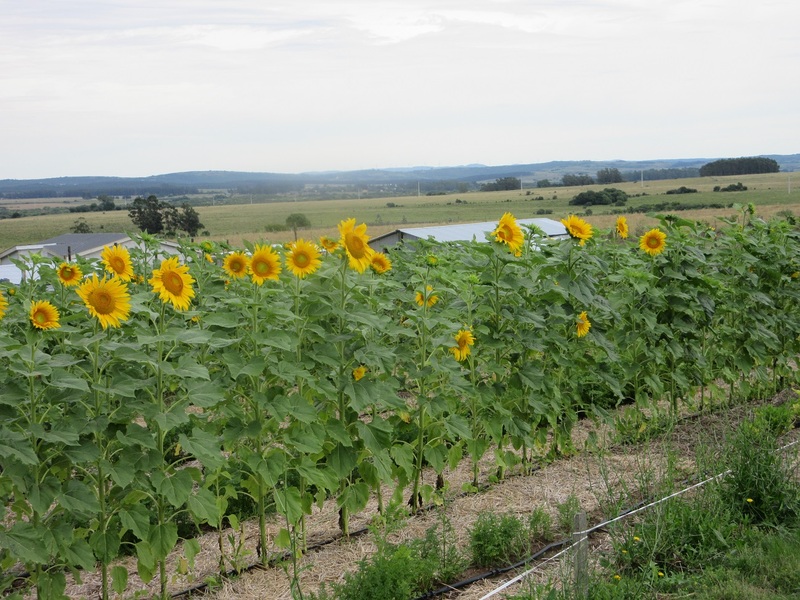 Megan debated over trying to use the sunflowers as trellis as her research showed that there was some debate as to what would grow planted in companion with the sunflowers. 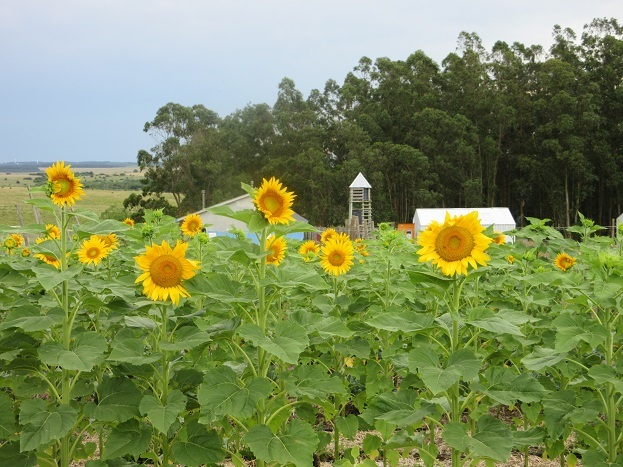 Some sources said the beans and squash (cucumber, in our case) would do well – other sources argued that sunflowers are fairly allelopathic, meaning they secrete some something from their roots which inhibits the growth of other plants around their base. Once the sunflowers were tall enough Megan planted beans and cucumber seeds at the base of the sunflowers. Few if any cucumber seeds germinated and the bean plants have had very, very poor growth. So, next year the sunflowers can be shade but we’ll skip the trellis expectations. On an entirely separate note, the sunflowers are beautiful to just enjoy. As my sister made comment, they are the only colorful thing on the farm right now. Even if they do block Jon’s view of the water tower from the house. We have a few planter beds off our front patio. We’ve had them for a couple of years now but haven’t really done much with them. We had thought to plant herbs. Just walk out the front door, cut a few fresh herbs, and put them in your meal. It was nice for awhile, until the herbs took off and overran the beds, or they died from lack of water or being crowded out from weeds. Nice idea, but didn’t work for us. We might try again in the future. 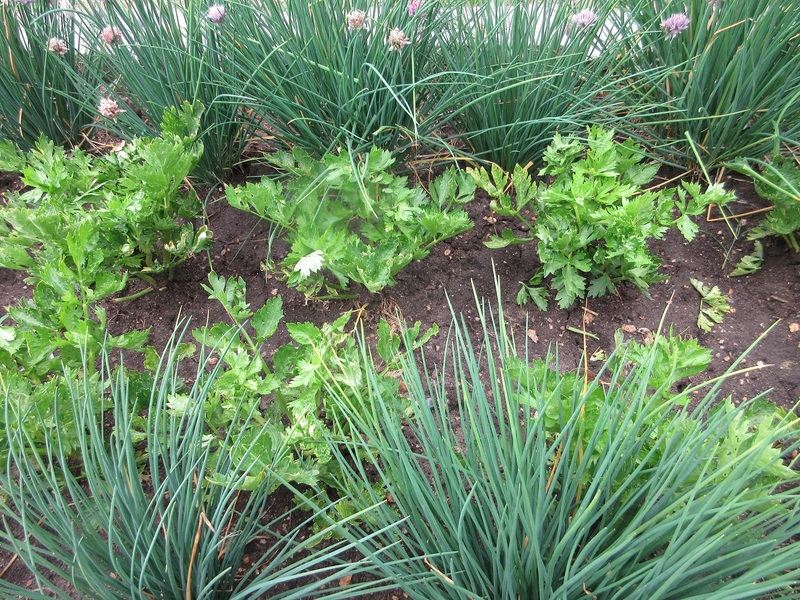 So this season after weeding and amending the soil, we planted salad ingredients. We have lettuce, arugula, chives, celery, radishes, and onions. Perennials still alive from last year are a hedge of rosemary, some oregano, and mint. So far the pick your own salad is working, we have a salad every night. 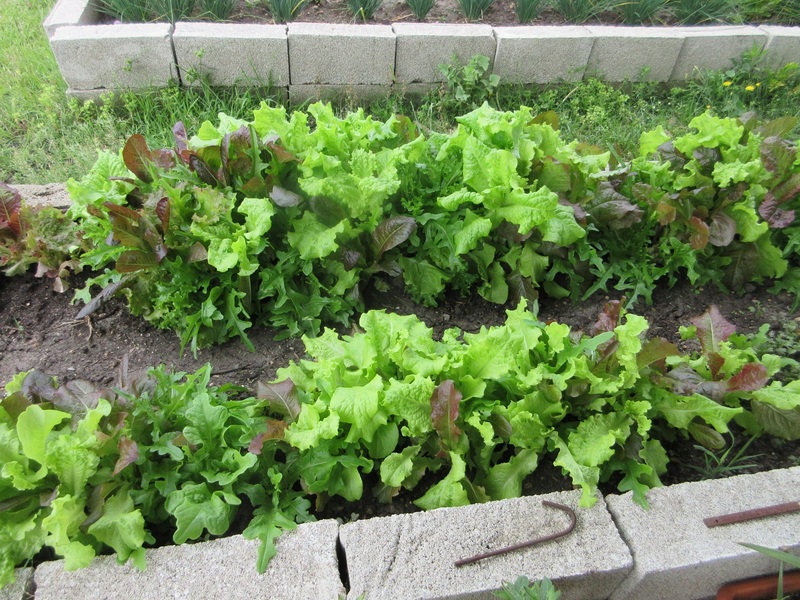 These pictures are early in the season, now all the vegetables are fully grown and fill the beds and our salad bowls. Now we just have to learn how to make some new creamy dressings. Admin note: so technical issues weren’t quite as resolved as Megan had hoped. Megan thinks it’s now resolved. With luck we’re all back up and running. It has been so long since we have written, it’s hard to know where to pick back up. Farming is so very much dependent on the weather and the seasons – fighting either is a fool’s game. But seasonal means cyclical and we have been writing notes about our adventure for nearly four years and so many things seem redundant to share. 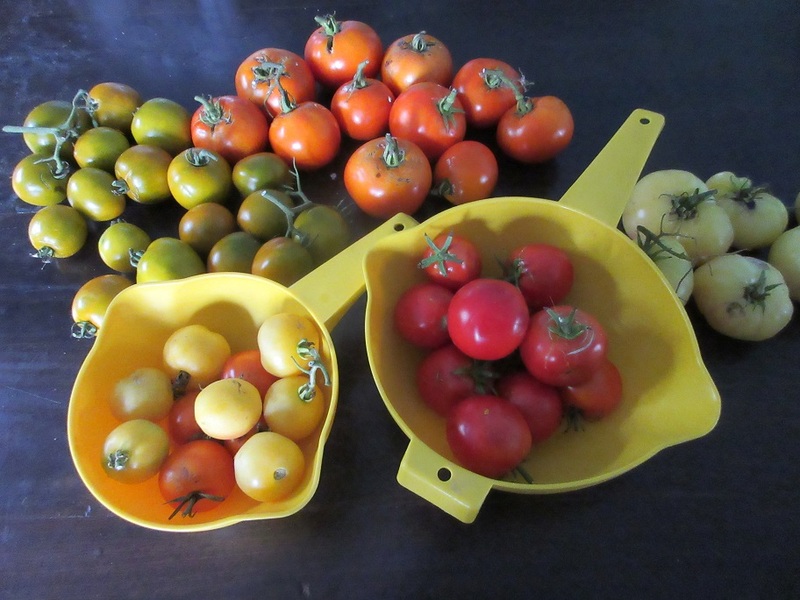 How many times can we write about planting tomatoes and still make it interesting? It’s always a bit of a struggle to figure out if the mundane is of interest or if we should just highlight the big changes. So thank you for being interested in our lives. It’s summer right now – hot, humid, and very, very sunny. The weather gods have been kind to us this year. It has been hot and humid as usual, but this year we are getting the much needed rain. Just about the time we worry about having to water the trees, we get a really nice rainfall, and at night! We received 33 mm at the end of last week, and three weeks ago we had 26 mm. So at least this year our pasture is growing, the trees and vegetable garden are getting watered and we have yet to have to buy supplemental feed for the cows and sheep. The good summer weather, no matter how hot, is a nice change from the spring. Spring arrived with lots of heavy rain and cold winds. We lost a lot of flowers and leaves off the olive trees and our fruit trees. Some of the vegetables Megan had already put in the ground, other seedlings were hardening off – a large percentage of both died from the frigid winds. 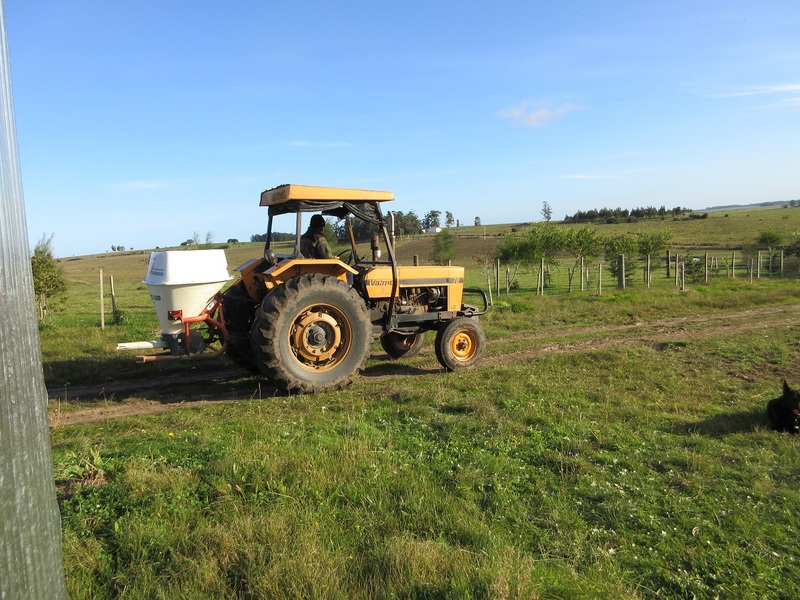 It set back everyone in the region with regards to getting the spring planting done – from backyard gardens to large plantation crops. 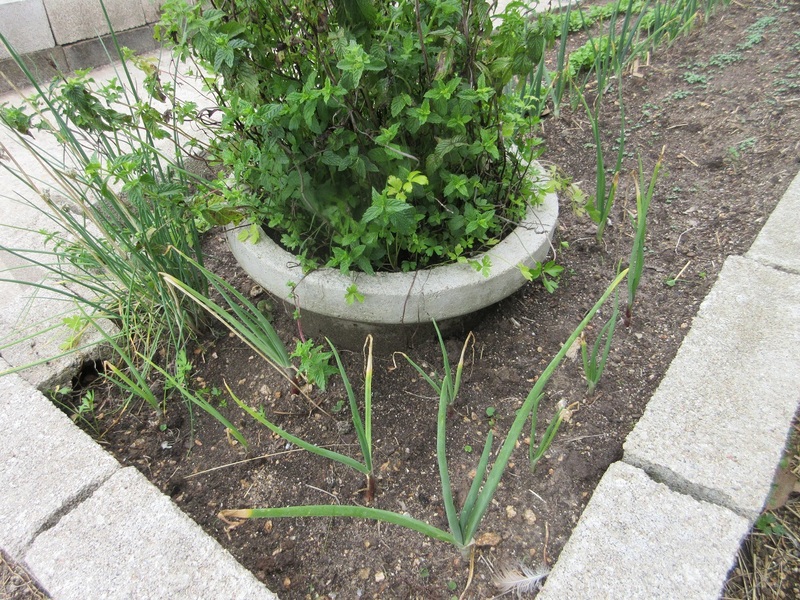 Our garden was already been behind in getting planted because our garden beds did not get properly winterized and we needed to amend some of the beds, so it was first “fix” the bed then plant it. But hard to fix a bed when it’s mud and weeds long into spring. So in stead of fixing the beds first, one of the first things we felt obligated to plant was potatoes. Due to the overall poor weather for the last two years, the potatoes available to purchase have been of marginal quality. Megan found, bought, and we then planted about 500 seed potatoes. So while I had a hard time understanding why we created yet another garden plot in which to plant potatoes, we did. (Megan gave lots of explanation. Jon concurred. Ruben agreed. It’s still a whole extra garden bed.) We worked hard and fast to get the seed potatoes into the ground during their planting window. Despite agreeing on the merits of a potato bed, Ruben did not agree with Megan on how to plant the potatoes. So, we did it his way. 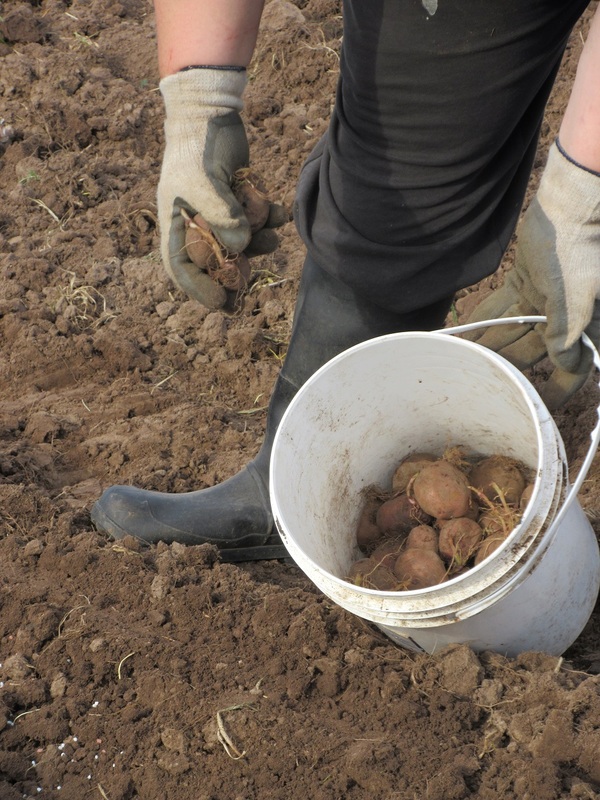 Due to a combination of weather, our soil, and the manner in which the potatoes were planted, we had a failed crop. Next year, we will try again. This time planting them Megan’s way.